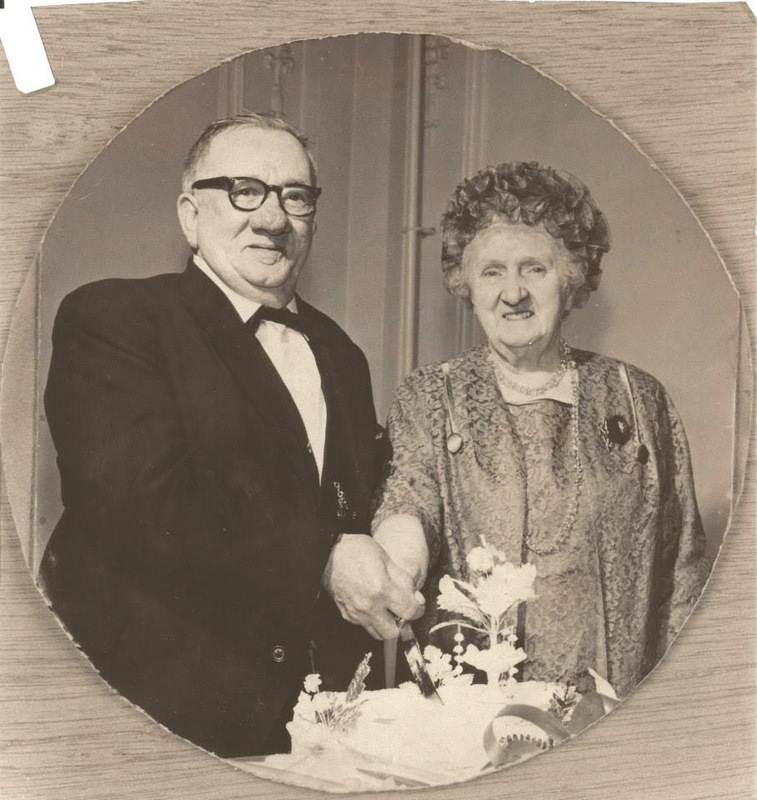 60th wedding anniversary, Catherine Black and Alexander Cruden, March 1968. Image: Leslie family archive. As I child I remember being told that my mother’s maternal grandfather, Alexander Cruden (1890-1970), had served in WWI and had a leg amputated. I’m not sure if I was also told he’d served in France, or if I just assumed that to be the case. Like so much family history research; this story starts with just that one nugget of information. Mum thought he may have served in the Gordon Highlanders, and she knew for sure he’d spent time after the war at Edenhall Hospital in Musselborough. She gave me photos of him and other ex-servicemen from Edenhall, possibly taken in the early 1920s. Patients at Edenhall Hospital for Limbless Soldiers and Sailors. 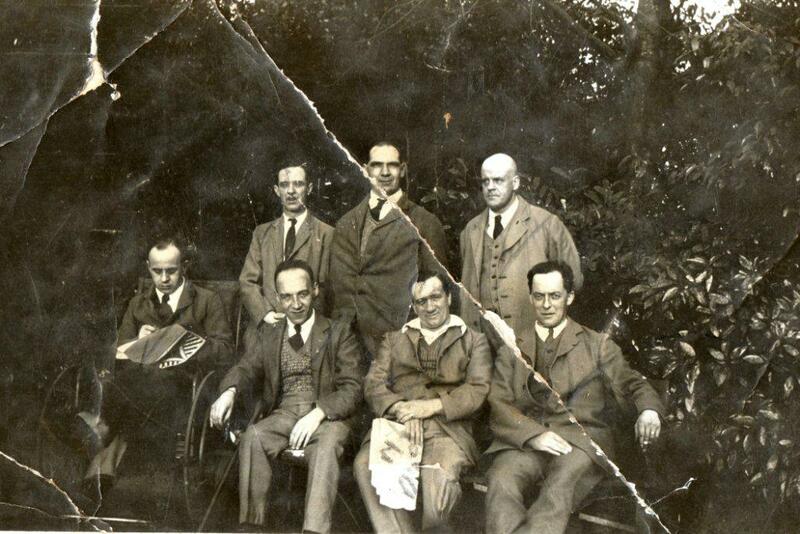 Alex Cruden is seated, third from the left. Image: Leslie family archive. But that was all she knew. Without being sure of great grandad’s regiment, searching for his service records proved difficult. Alexander Cruden is not an uncommon name in Scotland, and about 40 percent of British WWI records were destroyed during the Blitz of WWII. Recently though, I had a breakthrough. I found out about the Silver War Badge (SWB). This was given to WWI military personnel – like my great grandfather – who had been discharged because of wounds or illness. The records of Silver War Badge recipients are available on Ancestry. These records show only one Alexander (shown on the record as Alex) Cruden as a recipient of the SWB. The age shown is consistent with my great grandfather, and the regiment he served with was the Gordon Highlanders. The SWB record showed that Alex had served overseas and provided a service number – S/1891. From the blog Army Service Numbers 1881-1918, I could confirm that S/1891 was an actual service number for the Gordon Highlanders, and that the S/ in front of the number meant it was a wartime enlistment – rather than someone joining the regular force. I also learned that this number would have been issued in the first weeks of the war, between August and September 1914. Knowing that local newspapers in New Zealand published lists of those who enlisted to fight, I wondered if Scottish papers did the same thing, and searched the local Kirkcaldy newspaper, The Fife Free Press, for August-September. Sure enough, on Saturday September 12th 1914, under the headline The Call to Arms Kirkcaldy Recruits Still Rolling Up, I found my great grandfather’s name amongst the Gordon Highlanders. Given the Scottish propensity for naming children after grandparents and parents, finding the name doesn’t automatically mean the report referred to my great grandad, and if it had been any other member of my family, I would have known much more research was involved. But the Cruden family was relatively new to Fife, having come from Dundee when great grandad was a child. I checked the 1911 census (using quite wide search parameters), and found that my great grandfather was the only Alexander Cruden of enlistment age in the county of Fife, and the only Cruden in Kirkcaldy. Armed with these bits of information, I was able to find Alex Cruden’s medal cards, which told me that S/1891 Cruden, Alexander was a Private in the Gordon Highlanders who was awarded the Silver War Badge, The Victory Medal, the British Medal and the 15 Star (properly known as the 1914-15 Star) . It also confirmed that he served in France, arriving on 10 May 1915. A beautiful crossing was experienced and we arrived in Boulogne at about 1pm. None of this is absolute proof that S/1891, Cruden, Alexander was my great grandfather, but it seems highly likely. However. My real interest is in finding out about great grandad’s war. When was he wounded? Where? What experiences did he have that he had to carry with him until his death in 1970? Neither Ancestry nor FindMyPast has a service record for Alex Cruden, so it’s likely to be one of the thousands destroyed in the Blitz. Without that, I have to rely on secondary sources — in particular newspapers which carried casualty reports, and the Regimental Diaries of the 8th Battalion, Gordon Highlanders. The National Archives has digitized these diaries and made them available to download. The Diaries fall into two parts; the first May 1915-April 1916; the second April 1916-November 1918. This coincides with the amalgamation, in April 1916, of the 8th and 10th Battalions. I know that Alex Cruden held the rank of Private, so it’s unlikely he would be named in the Diaries (unless he was court-martialled perhaps), but I did hope that by understanding when the Battalion was on active service, it would narrow the time-frames during which he might have been wounded. When I began reading, I discovered that in the first months of the Battalion’s tour in France, daily casualties were listed in the Diary. For “other ranks” the information included their surname, service number and rank, and whether they were killed or wounded. In some instances, the cause of their wound/death was recorded. This changed in late September when the Battalion was engaged in the Battle of Loos. For that period, only the total numbers of dead and wounded were included. Sept 27th the total casualties from 25th to 27th September (?) were 17 officers and about 500 men. I’m almost at the end of the first Diary, March 1916, and I have found no record of Alex Cruden. I’ve also searched both the Fife Free Press and the Scotsman (which published casualty lists for all the Scottish regiments, as well as those of colonial forces, including NZ). Again, I have found no mention of Alex, and the service numbers recorded next to the names of dead and wounded are climbing steadily into five digits. Did my slightly built, 5′ 2″ great grandad survive almost a year at the Front without being wounded? Have I missed his name on a casualty list? Or did it somehow get left off such a list? Or more worryingly, have I got it completely wrong and S/1891, Cruden, Alexander is someone else altogether. 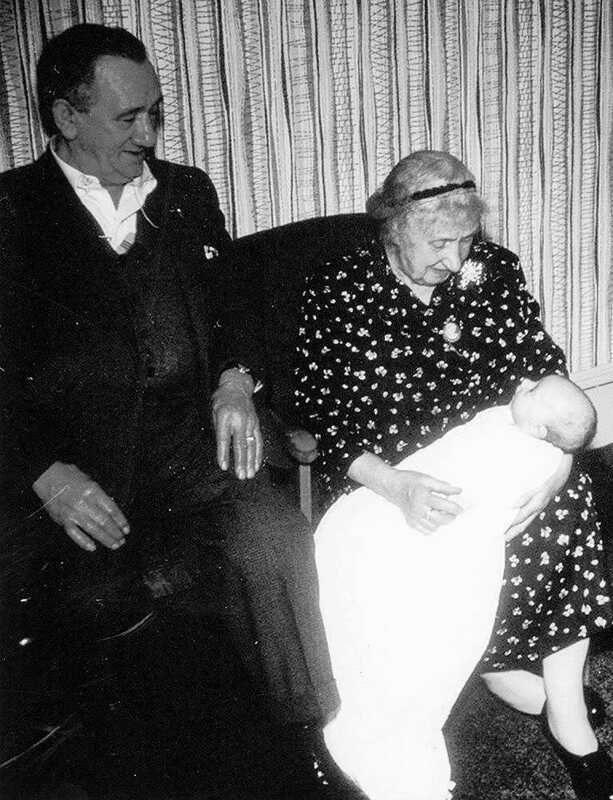 My christening; with my great grandparents, Alexander and Catherine Cruden. Image: Leslie family archive. Both the British War Medal, 1914-18 and the Allied Victory Medal seem to have been awarded to all officers and men of the British and Imperial Forces who either entered a theatre of war or entered service overseas between 5th August 1914 and 11th November 1918. The 1914-15 Star was awarded specifically to all who served in any theatre of war against Germany between 5th August 1914 and 31st December 1915, except those eligible for the 1914 Star. This entry was posted in Archives, Cruden, Genealogy and family history, Research, Scotland, WWI and tagged 8th Battalion Gordon Highlanders, Alexander Cruden, Gordon Highlanders, Kirkcaldy. Bookmark the permalink. ← … another brick in the wall? Amazing how much you have found out. Interesting that Alex Cruden was still at the Hospital in 1920. I suppose treatments went on for a long time; adjustments, surgery etc. Thanks. I’m poring over casualty reports in the Scotsman at the moment; really hoping to find him (and confirmation of my research). They make extremely depressing reading! Sounds like Great Gran didn’t put up with too much nonsense. The word “formidable” could have been coined just for her. She had a tough life; mother died when she was very young, pregnant and married at 17, husband away to war for years and then a lifelong invalid, five kids including one who caused a bit of grief over the years. She was a tough cookie!!! Hats off to her! Some of my female ancestors were formidable, too. I feel quite wimpish in comparison. Great work, and I am so glad you’ve posted this. Maybe someone will have some suggestions for where else to look. One thing that occurred to me was his hospital records—perhaps you have already looked for those, but if not, the hospital might have kept records that might reveal when and how he was injured. Also, do you have access to Fold3? I found a few medal records there for Alexander Cruden, probably the same as what you have found since they’re from the British National Archives. Thanks Amy. I have access to Fold3 this weekend through one of Ancestry’s promotions. Nothing new on Alex, except to find there was at least one other Alexander Cruden in the Gordon’s. Useful when/if I ever find a newspaper report! I have tried hospital records. There is a wonderful archive — The Lothian Health Services Archive — which has some records for Edenhall, but none that are relevant to him. As an aside though, the archivists there did help me find the records of Alex’s younger sister who died in childbirth. That demolished a family myth!!! I figured you’d already gone down that path. Too bad there was nothing there about Alex. What was the family myth about the sister? Yes. The Edenhall records are all for a different time period. I went back to the post and now remember reading it, though I would not have tied the two stories together after all this time. Still heartbreaking to read about May. It’s a family upon which much tragedy was visited. Great grandad’s only brother was killed in WWII when the ship he was on capsized in the Barents Sea. 😦 I hate when one family suffers so much heartbreak. So do I. But I have to admit there is a little bit of me that’s kind of grateful for the extra records that tragedies generate. My mainly poor, landless ancestors otherwise left very little recorded trace of themselves. It’s true. Sometimes I feel guilty when I get excited to find a horrible story I can write about. Interesting and painstaking research. I’ve just acquired British War and Victory medals for my grandfather (paternal) and great uncle (maternal). My maternal grandfather would have been too young to fight. I think my mum is clearing the decks and making sure these things go to the only member of the family who might be interested! It’s great that you now have the medals!! When you realise what those men and women experienced, holding on to any acknowledgement of their service is very important. And I know what you mean about finding someone to take family stuff; Mum has been very glad to pass things on to me. When my paternal grandfather died, my aunt cleaned out his house and threw everything out. She didn’t like his taste, had no time for “knickknacks” and thought all old stuff should be in the bin. My dad still feels quite bitter about that. Yes, it’s important to remember. The medals give me a sense of time too. I mean, I know logically that my grandfather was in 1WW, but I find it hard to believe. It makes me feel very old for one thing! It’s easier to believe with a tangible piece of history in my hand. How shocking of your aunt to do that without consultation! She wasn’t the sharpest knife in the drawer! Wow Su, great research. I love the photos, especially showing baby you with the “greats.” Frustrating that you haven’t found him yet but you have found a lot! Only 5’2. That is so much shorter than most men today. I discovered that my dad’s father was 5’4 and played American high school football 120 years ago. That would never happen today! I love that photo too. I seem to be looking so,adoringly at great gran. I guess people were much shorter then; nutrition not being as good. Everyone in my family is pretty short. My brothers and I — the milk-fed Kiwis — are definitely the tallest. I think it was a nutrition thing. I’ve heard that people who lived through WWII had the lack of nutrition affect them a lot. Not in the U.S., but elsewhere. Europe for sure. Was it like that in your country? I’m sure that did affect your parents. So many went through so much! Cheap and plentiful here since the fifties, too, although now the prices of food have increased a lot–and that is hurting restaurants, but not necessarily driving people to cook more as ingredients are costly! It’s the same here. When I look at how cheaply restaurants can produce food, I really have to question the quality of the ingredients they’re using. It’s crazy that soft drinks are cheaper than water. And we wonder why obesity is such a problem! What a fascinating story; I think it is commendable of you to research your family and bring their stories back to light…and they are so interesting to boot! I have always said that I would research my background if someone gave me a hint that I come from a line of royalty rather than from their serving staff! I don’t know how I missed this one. So well written. Have you learned anything new? Nothing new ☹️. I got very down reading the regimental diary, and put the project aside — along with everything else that requires me to go to my non air-conditioned office. It is so incredibly humid here, stepping away from the air con feels like being smothered with wet, warm blankets. Amazing sleuthing, Su. That baptism photo melts the heart. Lord, what a depressing thought, to give one’s all and then be overlooked. I hope that’s not the case. Isn’t it. I guess administrative errors would have been quite common — especially at the clearing stations. When I look at the casualty numbers on some days, I can’t imagine how people managed to do “the paperwork” amid the death and pain and general confusion. Truly. It boggles the mind. Hi Rob. It does seem like Alec Cruden is a very common name and I’m having similar issues trying to untangle the various threads. Are you still in NZ?